Rajasthan is the land of kings and forts. With its cultural diversity, Rajasthan represents the sculptural and architectural expertise of its rulers.Also the aesthetic tastes and the tales of valor and courage of its various rulers. A place’s monuments reflect the history of the place. Rajasthan is known for its Rajputana kingdoms and for the muscular and aesthetically stimulating forts and palaces. 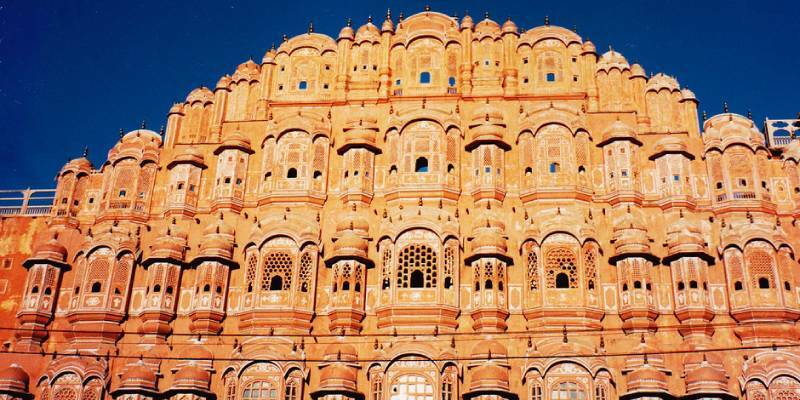 Hawa Mahal is one of these forts which represent the Rajputana culture and pride. Hawa Mahal is the magnum opus of Rajputana style of architecture. Maharaja Sawai Pratap Singh constructed it in 1799. Hawa Mahal is an extension of the City Palace. Different stories which are attached to the construction of Hawa Mahal. a) Some claim that Hawa Mahal was idealized on the lines of “Khetri Mahal” in Jhunjhunu region. Bhopal Singh’s Khetri Mahal impressed the Maharaja immensely . b) The other tale explains the construction of Hawa Mahal is for the royal women who used to be in Purdah during those days, with the numerous windows they can watch activities and events without having to come in front of strangers. It shows the rulers care for gender parity though the steps are very subtle but evolutionary in nature. c) Also a more famous story says that Maharaja was a devotee of Lord Krishna and he constructed Hawa Mahal as a depiction of his devotion. The major architect of this grandiose palace is “Lal Chand Ustad”. It is a five storied building in pyramidal shape and is 50 feet in height .The architecture of the Palace clearly reflects the influence of Mughal architecture; hence it is an example of a beautiful mix of the Rajaputana architecture and Islamic architecture. This shows India has always been a land of unity in diversity. The Rajputana style of architecture is evident in pillars and floral patterns. The crown shaped dome is a A characteristic of Rajput architecture is the top of the palace in shape of a crown. The arches are of Islamic origin. There are 953 windows in the palace.The Windows are constructed in a beehive manner.One unique feature of Hawa mahal is the sandstone carvings and decorated crown. The use of red and pink sandstone goes well with the surroundings and it appears as a magnificent piece of architecture in between a crowded market. The summers in Rajasthan are unbearably hot, so the best time to visit Jaipur starts from October to March, the weather is pleasant. Hawa Mahal is located in the southern part of Jaipur. It remains open from 9:30 am and starts to attract national and international tourists since the inception of the day. There are many attractions near Hawa Mahal one days Jaipur Sightseeing ; one can do Rajasthani shopping from the nearby shops. Hawa mahal is famous for the shops of different types of “Safas”, Rajasthani turban.Other places to visit near Hawa Mahal are Lakshmi Narayan Temple,Govind Devji Temple and Jantar Mantar,etc. For a peaceful stay there are many hotels around the palace. Some suggestions are Park Inn, Hotel Madhuban,Hotel King Palace and Hotel Anuraag Villa. Explore the beautiful sites of hawa Mahal jaipur with our Tempo Traveller in jaipur tour at below mentioned fare.